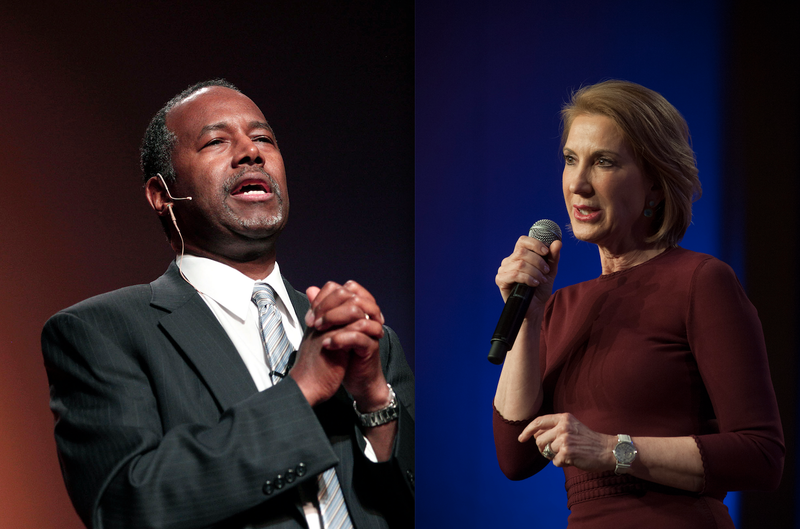 How much are Carly Fiorina and Ben Carson worth? Republican presidential candidate Carly Fiorina is worth nearly $60 million, according to documents provided by her campaign. The former Hewlett-Packard executive and her husband Frank, a retired AT&T executive, have a net worth of $59 million -- a number that includes their $6.6 million home in Virginia, and over two million more in "additional real property." Hillary Clinton's income a 2016 campaign issue? "I've taken hundreds of questions--whether about hot dogs or my personal finances--and I think it's all fair game," Fiorina said in a statement accompanying financial papers provided by her campaign. "I think leadership of any kind requires trust and transparency and voters should demand no less from their political leadership in government." Who is presidential candidate Carly Fiorina? Fiorina -- who has previously knocked Democratic candidate Hillary Clinton for her campaign's lack of transparency -- disclosed every stock, bond, and fund she owns shares in, in addition to the compulsory personal financial disclosure filed with the Federal Election Commission. The GOP contender also provided her 2012 and 2013 federal tax returns, as well as state returns from those years. The Fiorinas reported nearly $2 million in earnings in 2013, according to their tax return. They earned $1.3 million in 2012. The couple's effective tax rate, including federal, state, and local taxes, was 30 percent in 2012 and 2013, and their effective federal tax rate was 20 percent, the documents said. They also gave an average of 14 percent of their income to registered charities. Fiorina owns stock in several media companies, including CBS Corporation, Comcast, Disney, and Viacom. Her largest stock holdings include tech companies like Apple (over $214,000 worth) and Microsoft (over $125,000), pharmaceutical companies like Novartis (over $133,000) and Pfizer (over $101,000), and banks like Citigroup (over $117,000) and AIG (over $113,000). The tech executive still has $13,123.50 worth of HP stock, but cashed out $262,826.06 in a "sale of call options for Hewlett-Packard Company (HPQ) common stock," according to a notation at the end of her filing. GOP candidate Ben Carson didn't release a trove of tax documents like the former tech executive, but his personal financial disclosure forms revealed his not-insubstantial earnings. Who is presidential candidate Ben Carson? The neurosurgeon-turned-presidential candidate reported that he and his wife Cindy earned between $8.9 million and $27 million over a recent 16 months. According to the documents viewed by the Wall Street Journal, Carson delivered 141 paid speeches and earned over $4 million from January 2014 to May 3, when Carson announced his 2016 bid for the White House. The GOP contender also earned between $1.1 million and $6 million in book royalties and between $2 million and $10 million while serving on the boards of Kellogg Co. and Costco Wholesale Corp. Carson drew in an additional $200,000 to $2 million from his work contributing to the Washington Times and Fox News. Candidates' incomes tend to attract attention during campaign cycles. Well before she had declared her candidacy, Democrat Hillary Clinton came under fire last year when she said that she and her husband were "unlike a lot of people who are truly well off." The Clintons have earned over $100 million since President Clinton left office. Since January 2014, they've earned more than $25 million. CBS News' Senior Political Editor Steve Chaggaris contributed to this report.